Good morning, Nashville. 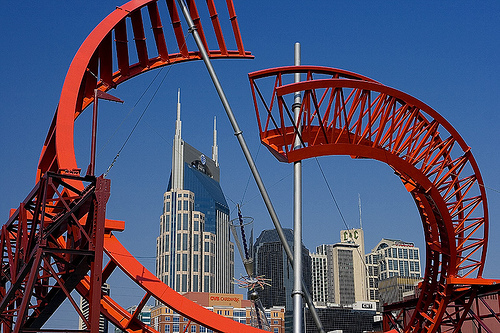 We all sort of scratched our heads when Metro decided to install this weird-looking piece of public art down by the riverfront last year. As it were, the Ghost Ballet for the East Bank Machineworks sculpture was one of the 45 pieces of public art recognized as outstanding by the group Americans for the Arts. We’re guessing it still won’t stop the tourists from pausing and asking us, “Why is there a roller coaster by the river?” Sigh. Horsing around. Two new horses have been added to the Hendersonville Police Department. Regarding his new horse, Officer Nathan West tells WTVF, “He’s my partner. He is. He’s been taking care of me and I’ve been taking care of him.” Too much cute for this early in the morning, right? Ballin’. Congrats to Shan Foster, Vanderbilt forward, who’s been drafted by the Dallas Mavericks as their 51st pick for the NBA draft. Bits & pieces. More talk about Wilson County Bible Park … A creepy guy is broke into an apartment on Woodlawn Drive and fondled some girl in her sleep, and police have a sketch … Oil prices shoot past $142 per gallon … Cool Springs may get 600 new jobs.